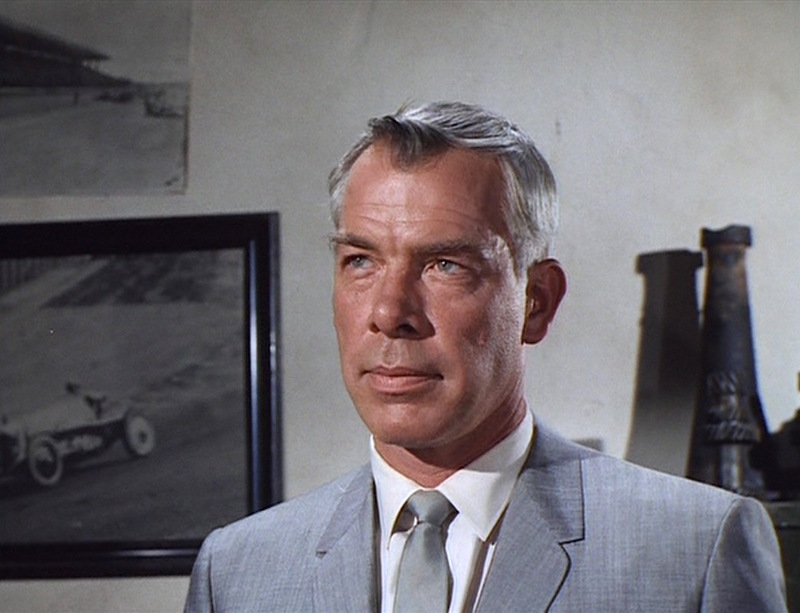 Lee Marvin as Charlie Strom in The Killers (1964). 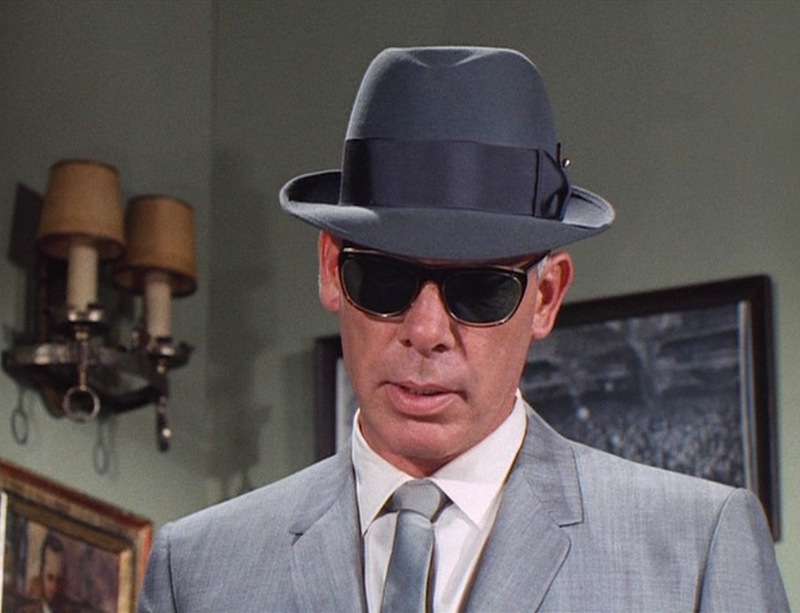 Tomorrow would have been the birthday of Lee Marvin, who was born in New York on February 19, 1924. After his WWII service with the Marine Corps, Marvin spent a few decades acting before lighting up the screen as introspective assassin Charlie Strom in Don Siegel’s adaptation of The Killers. In addition to his first top-billed film role, The Killers also led to Marvin winning the BAFTA Award for Best Actor (in addition to his role in Cat Ballou). The story originated as an Ernest Hemingway short story in 1927 and was first filmed in 1946 with Burt Lancaster, Ava Gardner, and William “Fatman McCabe” Conrad in his first credited role. In a rare instance of an author appreciating the cinematic adaptation of his work, Hemingway was reportedly quite pleased with this now-classic film noir that borrowed his words for the opening act before taking audiences through the totally original story co-penned by Richard Brooks, Anthony Veiller, and John Huston. For me it took the 1964 Don Siegel movie version of The Killers to realize the true genius of Hemingway’s story. That movie is a further step removed from the text, more a movie remake than straight adaptation of the Hemingway story. The Siegel film retains the killers, removes the Nick Adams character, but leaves Lee Marvin’s hitman character to obsess over all that had first puzzled Nick when the story was first published in Scribner’s in 1927. 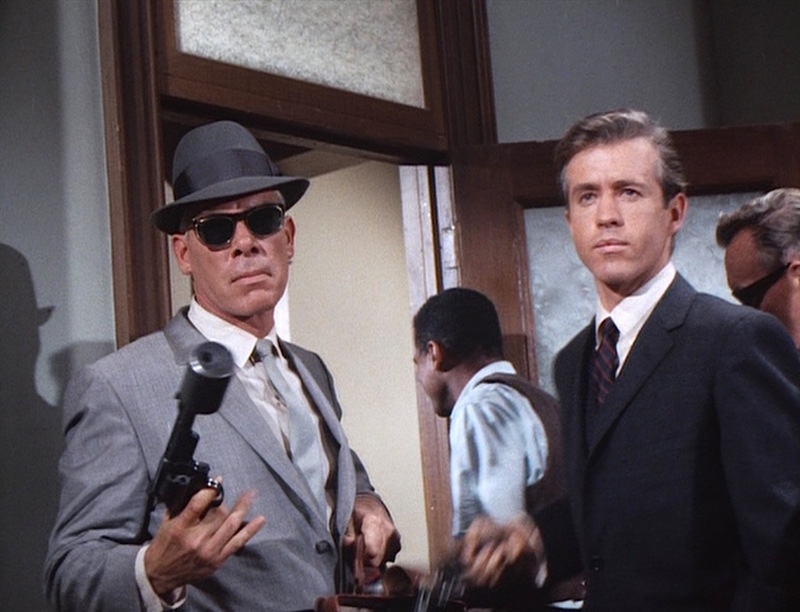 The Killers begins with its two laconic hitmen, Charlie (Marvin) and Lee (Gulager) striding into a school for the blind, searching for a teacher named Johnny North (John Cassavetes). North receives a warning call, but he calmly waits at his desk as Charlie and Lee swiftly gun him down. The psychotic Lee is satisfied by the large payout coming their way, but Charlie is bothered by North’s acceptance of his fate and determines that there is more to the story. 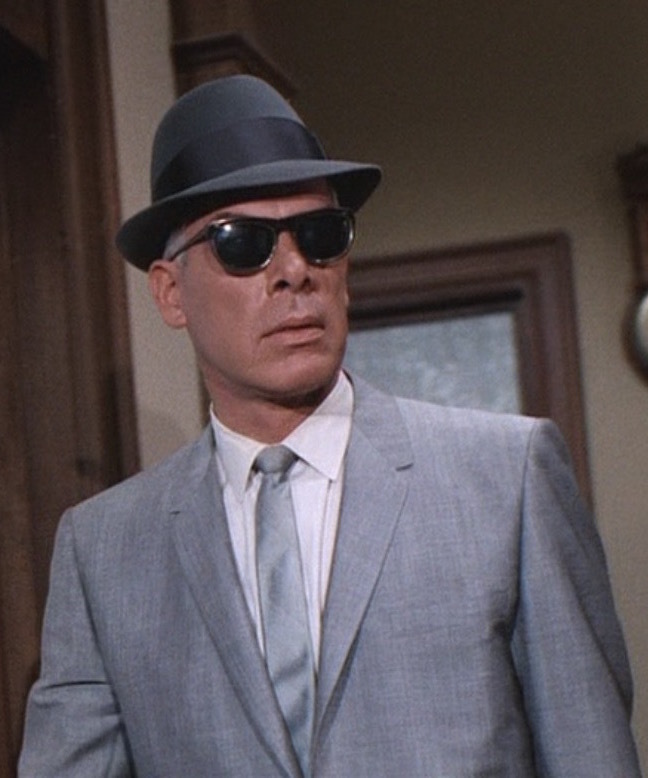 Charlie Strom’s light gray semi-solid silk two-piece suit immediately differentiates him as an outsider in the bucolic school for the blind in the opening act. In fact, Johnny North probably chose a place like this to hide since any professional killer in a silk suit would draw attention immediately. Charlie’s silk suit is more fitting when he goes to Miami, but even then his mechanic shop surroundings provide a clear contrast to his urban gangster ensemble. Charlie’s jacket has a welted breast pocket and straight hip pockets with slim flaps. The shoulders are padded, and the sleeveheads are roped with two buttons at the end on each cuff. The back has short double side vents. 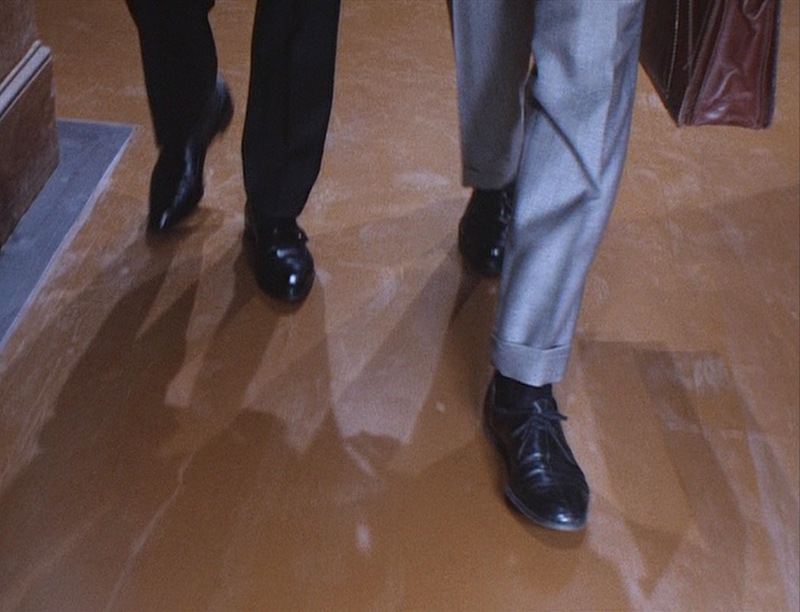 Since he keeps his jacket closed throughout this brief opening scene, the only confirmed detail about Charlie’s flat front trousers are the cuffed bottoms with their tall turn-ups. 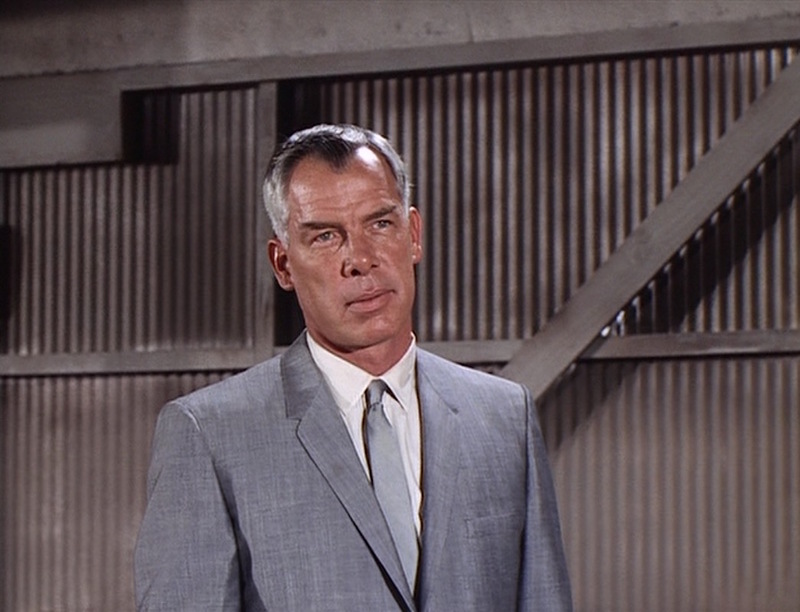 At 6’2″, Lee Marvin can get away with taller cuffs on his trousers without sacrificing the appearance of his own height. Each of Charlie’s suits in the film is differently styled, but the trousers seem to be consistent with on-seam side pockets, jetted back pockets with button loops, and belt loops, through which he wears a black belt when wearing black shoes. I think we can reasonably assume that Charlie’s trousers are similar to his others when it comes to some of these details. Charlie wears a white dress shirt with a spread collar and single-button squared cuffs. When relaxing on the train, he takes off his jacket and tie to reveal a front placket and pointed-bottom breast pocket. Charlie’s tie typically matches his suit, and his slim silver silk necktie with this outfit is no exception. The tie has a short length, and the pointed tip falls out of his jacket when he leans over with only the bottom button fastened. Charlie’s way with women could use some work. Charlie struts down the school hall in black calf leather 2-eyelet derby shoes with cap toes. Rather than matching his socks to his trousers, he wears a pair of black dress socks, likely made of thin silk. Although Lee has swagger, Charlie is clearly the leader of the two hitmen. 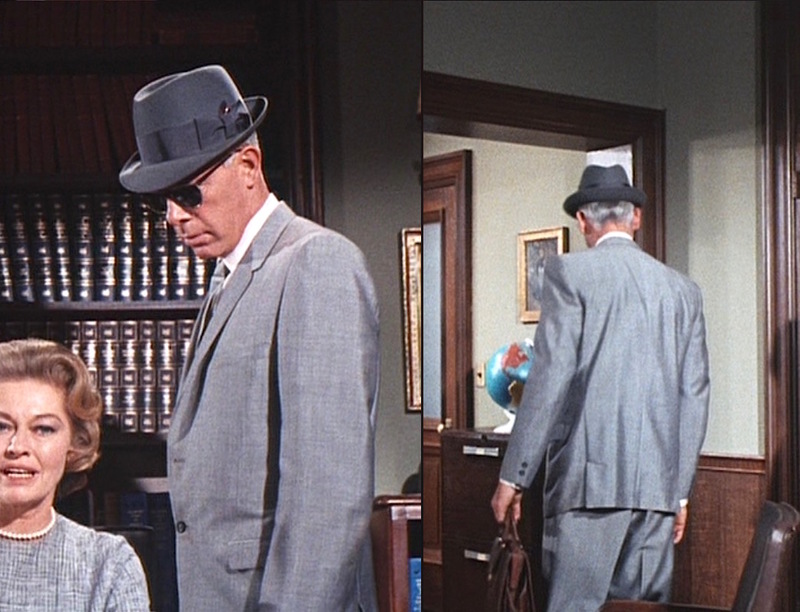 To show his cool indifference for his surroundings, Charlie keeps on both his hat and sunglasses while inside the school. 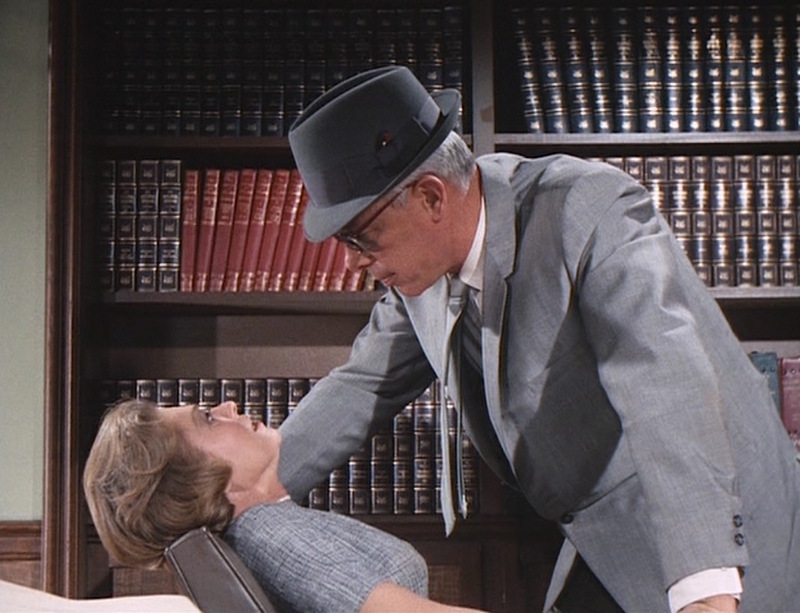 Even Charlie’s hat indicates his preference for sticking to shades of gray. Both the felt fedora and its wide grosgrain ribbon are darker gray, with a small red feather pinned into the bow on the ribbon’s left side. The fedora’s short brim is snapped down in the front. Charlie’s sunglasses have thick brown plastic frames with dark green lenses. Either he’s blatantly indifferent to the school’s sense of decorum or Charlie Strom is nursing one hell of a hangover. Although not very clearly seen here, Charlie appears to be wearing a stainless non-date Rolex Submariner ref. 5508 with a black dial and black bezel on a stainless link bracelet. It is best seen when wearing his glen plaid suit to lock Norman Fell into a sweatbox or when wearing his blue suit and firing his suppressed .357 during the gunfight finale. Unlike other professional killers, Charlie Strom doesn’t care that his sharp clothing draws attention. In fact, he seems to relish looking every bit the intimidating gangster. Charlie’s weapon of choice for the opening hit is the same blued Smith & Wesson Model 27 that he would use during the finale. Despite the relatively useless suppressor, Charlie’s weapon of choice is far from useless itself. Smith & Wesson first introduced the venerable .357 Magnum cartridge in 1935 for its Registered Magnum model. The .357 Magnum quickly gained a reputation as a powerful and reliable self-defense round, and shooters also appreciated that .38 Special rounds could be fired from a .357 revolver. When Smith & Wesson began numbering its models in the mid-1950s, the large carbon-steel N-frame .357 Magnum was officially designated the Model 27. The movie’s titular killers, doing what they do best. Charlie Strom is clearly a fiercely independent, unique brand of assassin. He’s confident striding into a hit, wearing a flashy suit and blowing away his victim in a room full of witnesses, then he takes the time afterward to actually think about what he’s just done. It makes sense that he would carry distinctive weapons like the Model 27 and, as a backup, a Single Action Army holstered to his belt (as we’ll see later). While revolvers and semi-automatic pistols each offer their own relative pros and cons, one major benefit of a revolver to a hitman like Charlie would be the lack of ejected shells (and thus evidence) left on the scene. For his next violent revenge-crime flick, Point Blank, Lee Marvin would “upgrade” to the large-framed Smith & Wesson Model 29 in .44 Magnum. Buy the movie. The Criterion Collection offers a dual-pack with the original 1946 version starring Burt Lancaster as well as this 1964 update. I gotta find out what makes a man decide not to run… why, all of a sudden, he’d rather die. A very well written comment focused on a untypical point of public interest. Thank you very much!